The unique nature of Walter & Zoniel’s work often requires them to build the tools needed in order to create their artworks. 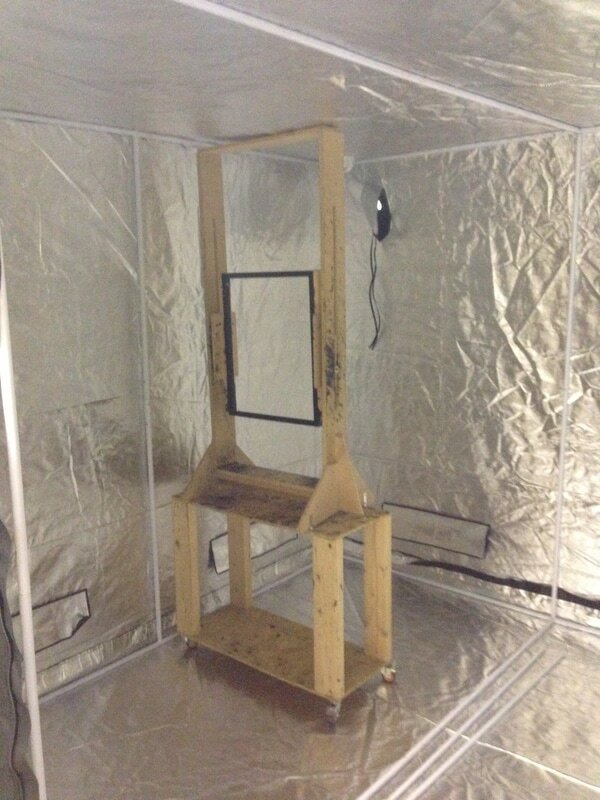 The WZBOX.3 installation is a wooden 8’x 8’ room-sized camera that was hand built by the artist duo Walter & Zoniel. Constructed in order to create many of their life sized portraits, it is akin to a ginormous box camera large enough to walk in. Inside it houses a giant tilt-shift mechanism used to draw focus by hand, and photographic chemistry for the creation of their photographic artworks. The artists use a 160 year old antique brass lens from their collection, adding another layer of unique effect to their work. Doubling as a dark room, Walter & Zoniel operate the camera from within by reflecting light from their subjects directly onto sheets of glass, tin or paper, covered in light sensitive photographic chemistry. This is the third incarnation of their WZBOX camera, constructed during a live residency at SHOWstudio. It has been used in the creation of a number of the artists’ wet-plate collodion ambrotypes and tintypes as well as their direct positive paper works. ICONOSTATUS was shot on this camera as were their REFLECTING THE BRIGHT LIGHTS and some of their ALPHA-ATIONS series of artworks. There is no negative involved in the creation of these works. Each image is entirely unique, as it is shot directly onto a light-sensitive surface, which is developed inside the camera becoming the final piece of artwork. The elongated exposure times used by the artists engage subjects in a meditative process unlike any other photographic shoot, resulting in mesmerisingly intimate and beautiful, life-sized images. A slightly more portable version of their WZBOX.3, as the camera casing is made of sealed, light resistant canvas. Is Walter & Zoniel’s largest camera to date. The WZBOX.360 is used solely for the creation of their ongoing The Untouched series, where the artists create full length life sized wet plate collodion portraits. 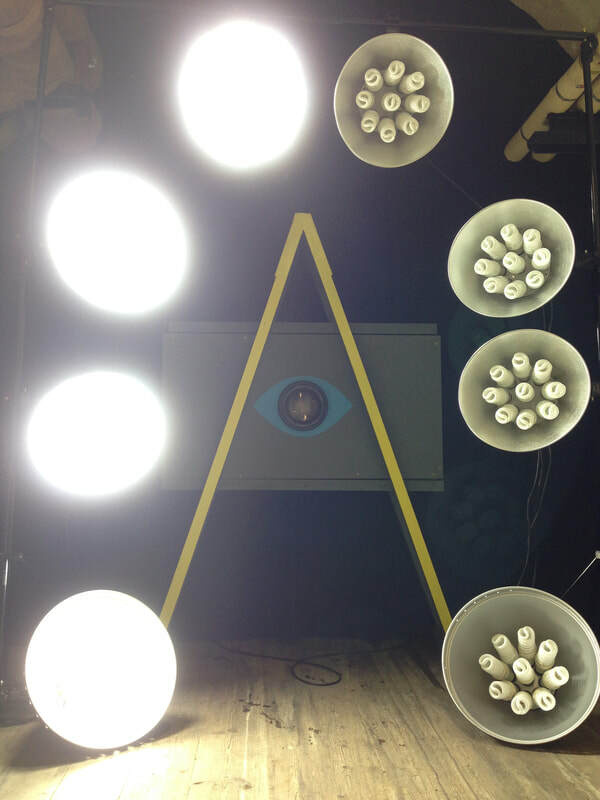 Test incarnations of the camera have used enormous underground rooms as the camera housing. 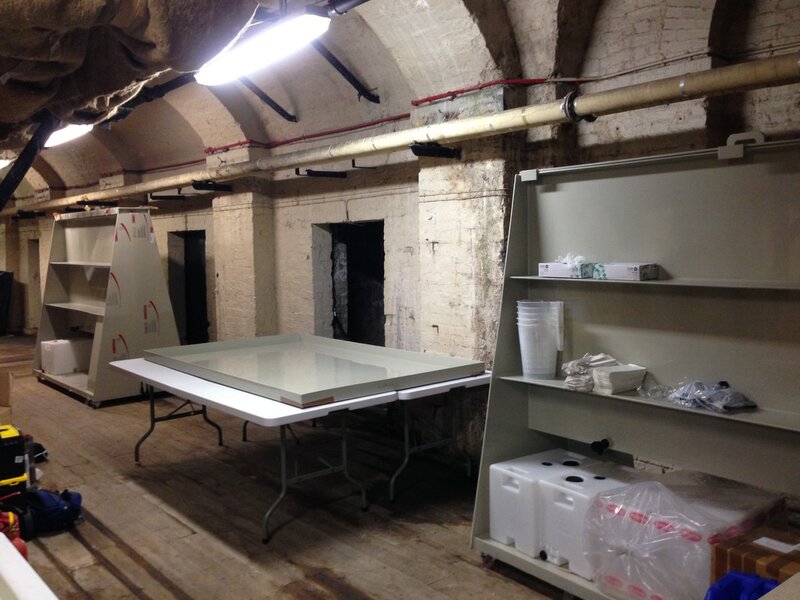 Somerset House’s DeadHouse, Gazelli Art House’s basements in Mayfair, and MC motors industrial underground spaces in Dalston. The WZBOX.360 is set to come out into the open air, above ground in 2018, a colossal 360 cubic metres. Housing their ginormous trays and dip tanks inside, and using a huge 1800mm lens. 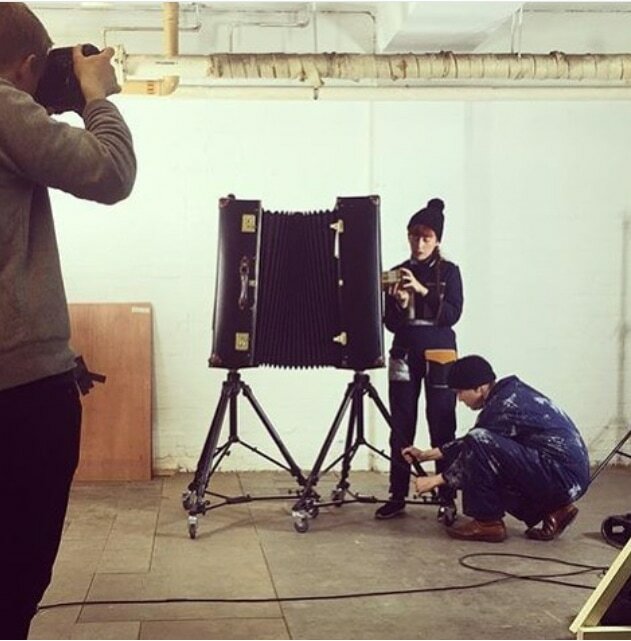 In a collaboration with Globetrotter, the artists built an extendable bellows camera. The WZ.CASECAM is housed within and retracts entirely into the body of a large Globetrotter trunk. 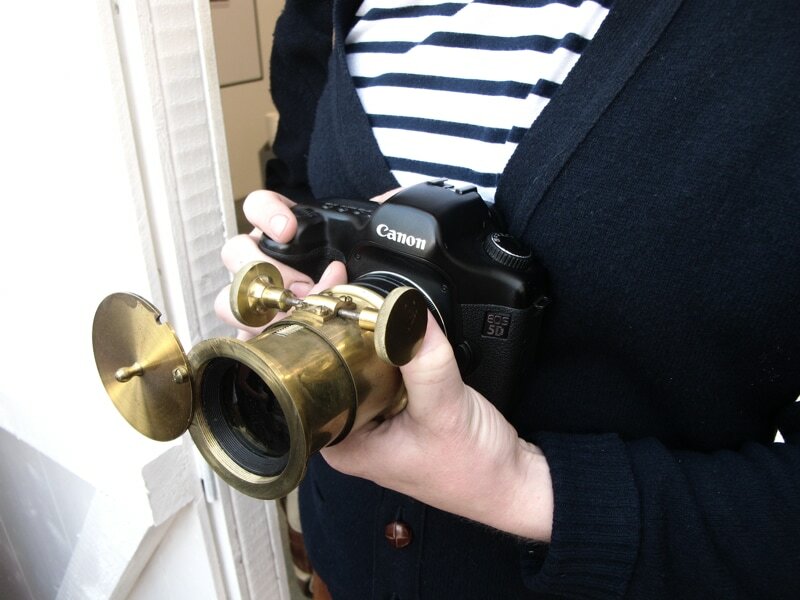 The unique camera houses a number of interchangeable 19th century brass lenses, and the artists shoot on a scale of up to 16” x 20”on direct positive paper. The WZ.DIGI/BRASS is an amalgamation of antique and modern technology, the artists adapted their collection of brass lenses from the turn of the 19th century to work with a digital camera back. Glass being a liquid which moves and warps over time gives this 150 year old lens a unusual and entirely unique effect to the artists' modern photographic works. 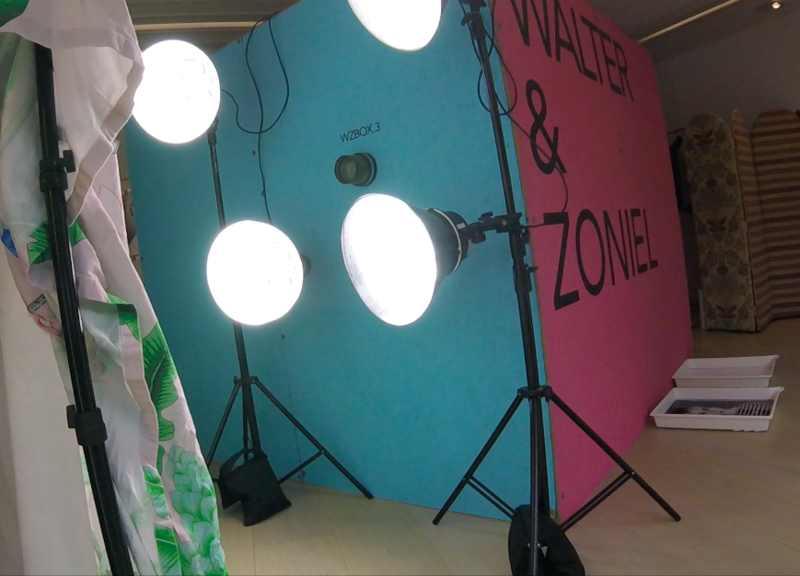 Representative of their personal style, Walter & Zoniel have used it in a multitude of their fashion collaborations.